zarinahtakesapaycut: Mr Paul Boorman, why so silent? The MD of PwC Malaysia, Chin Kwai Fatt, and some nice flowers. It is time to look back at all the questions that have remained unanswered, despite PwC's global leaders being fully aware of the many allegations raised against Chin Kwai Fatt & Co.
As the Global Leaders for Operations and Ethics/Business Conduct, how long have you known about the continuing fraud perpetrated by PwC in Malaysia with regards to the non disposal of PricewaterhouseCoopers Consulting Sdn Bhd (464379-U) to IBM Corp, when PricewaterhouseCoopers LLP sold its global management consulting and technology services business to IBM Corp back in 2002. The fraud is entering its ninth year now, and it begs disbelief that no one has raised any questions on this fraudulent act, especially when it contravenes the no-action letter released by the SEC with regards to the sale. 1. Does this not impact the global audits done by PwC for its client, IBM Corp? 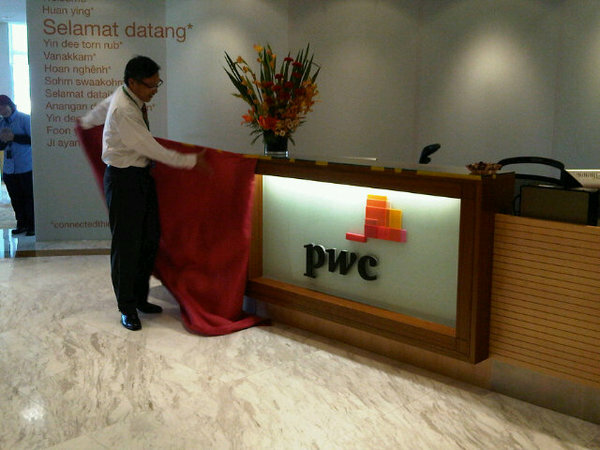 And what about the audits of IBM in Malaysia by PwC? 2. How is it that Mr Chin Kwai Fatt, the MD of PwC Malaysia is a Director in PricewaterhouseCoopers Consulting Sdn Bhd (464379-U) till today? Who allowed Malaysia to be the exception to the global sale of PwC consulting business to IBM? 3. How is it that Ahmad Johan bin Mohammad Raslan and Lee Tuck Heng remain as shareholders of PricewaterhouseCoopers Consulting Sdn Bhd (464379-U),which should be under the Global Business Services division of IBM, when PricewaterhouseCoopers is the Auditor for IBM Malaysia Sdn Bhd? 4. PricewaterhouseCoopers Consulting Sdn Bhd (464379-U) is being used to hide hundreds of millions of dollars worth of contingent liabilities, pure and simple. The global audit on IBM Corp is worth hundreds of millions of dollars in fees as well, but doesn't this sleight of hand negate the audit, as it establishes a direct financial interest between the auditor and the client? 5. How is the renaming of PricewaterhouseCoopers Consulting (East Asia) Sdn Bhd, to PwC Consulting Sdn Bhd (289801-A), and its subsequent sale to IBM valid, when the contingent liabilities were kept hidden in the real consulting arm of PwC in Malaysia, namely PricewaterhouseCoopers Consulting Sdn Bhd (464379-U)? 6. Is the sale process that began in 2002 complete yet, seeing that PricewaterhouseCoopers Consulting Sdn Bhd (464379-U) still exists, and if the sale is still technically incomplete, will this not make all the global audits of IBM Corp for the past 8 years suspect or invalid, if not downright illegal? 7. What about the signing of a false declaration by Chin Kwai Fatt with regards to the returns for PricewaterhouseCoopers Consulting Sdn Bhd (464379-U) in 2008? Gentlemen, it is time the Global Leaders remedy the situation, and it has to start with the dissolution of PricewaterhouseCoopers Consulting Sdn Bhd (464379-U) so that the fraud is stopped once and for all. The actions of Chin Kwai Fatt & Co will continue to haunt PwC in Malaysia as well as globally until it is seen that the Senior Management of PwC has started to take decisive steps to remedy the many wrong acts that have gone unchecked for so long, and still remain unanswered for.